The former Minister of Tourism and Hospitality for Zimbabwe, Dr. Walter Mzembi talked to eTurboNews Sunday night from his residence in Johannesburg after social media and numerous Zimbabwe and South African news sources reported that he was at a South African hospital and lost his battle with cancer in the early hours of Saturday morning. 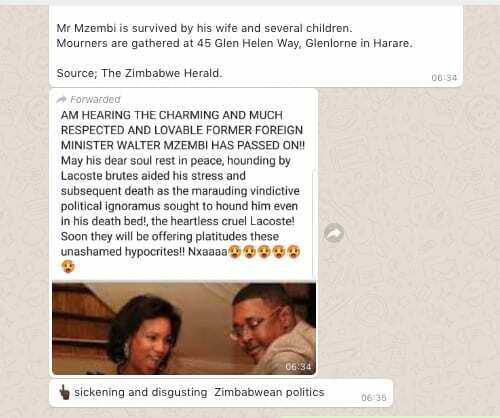 Earlier media reports claiming former Foreign Affairs minister Walter Mzembi has passed on have been dismissed as “idle nonsense” by his former G40 political ally Professor Jonathan Moyo. The security and political situation in Zimbabwe seems to be escalating. Zimbabwe President Emmerson Mnangagwa has launched a diplomatic offensive in an effort to tell his side of the story in the face of global condemnation sparked by the deadly clampdown by the army in the aftermath of the January 14 protests against steep fuel price increases. On Friday, the United States and the United Nations added their weight to calls by the international community for Mnangagwa to rein in the army, which is accused of killing at least 12 people and shooting of over 78 civilians. According to his spokesperson George Charamba, the Zanu PF leader was forced to skip his so-called “Thank You” rally scheduled for Mt Darwin in order to apprise regional leaders about the situation in Zimbabwe ahead of an Africa Union Summit set for Ethiopia in a few days’ time. The GSA for Italy of Cabo Verde Airlines, announced the airline has canceled all flights from Rome Fiumicino Airport starting July 31.